Royal blue shorts, with white drawstring. White seams, with a thick red vertical stripe in the middle and a thin royal blue vertical stripe on each side of the central red stripe. New-style red logo, overlaid with 'Admiral' in royal blue title case lettering on left thigh on a white embroidered patch. White socks, with red and royal blue stripe across tops (the same as for the 1974 white uniform). The Admiral logos were removed from the shirts and shorts for the duration of the 1980 European Championship final tournament in Italy. A white logo with 'Admiral' in red was worn at the base of the first digit of the shirt number against Kuwait. A white logo with 'Admiral' in red was worn on both of the digits of the shirt number against West Germany at Wembley in 1982. 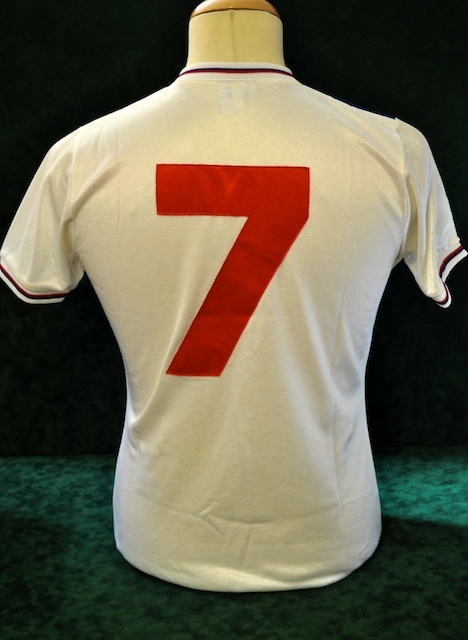 A white logo with 'Admiral' in red was worn at the base of the first digit of the shirt number in the next 10 games in which the shirt was worn, following the West German game at Wembley. 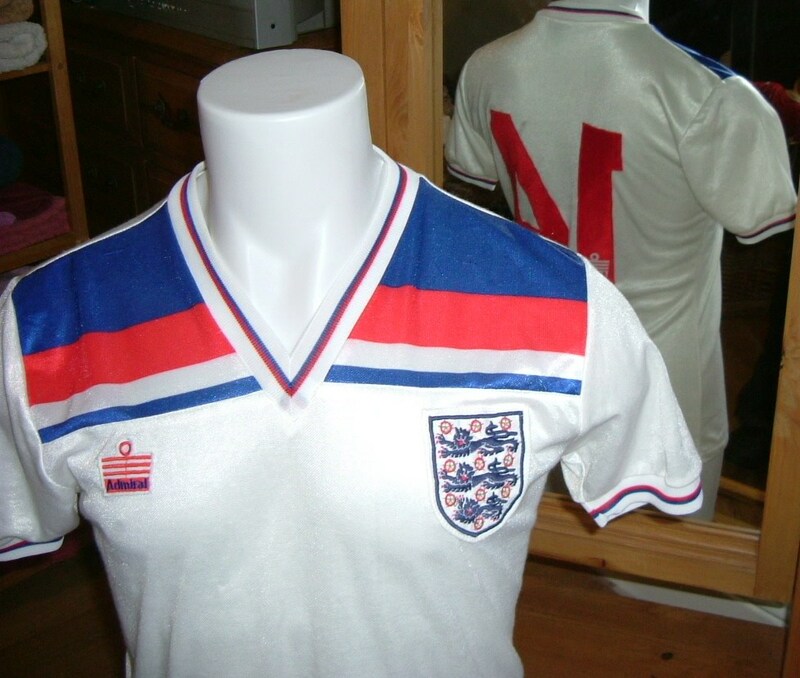 Only Paul Mariner wore an Admiral logo at the base of his number for the final game that this shirt was worn, in Luxembourg, after he changed his shirt following a blood-stained head injury sustained when he scored the second goal, his last for England. For the three games in which this uniform was worn at the 1982 World Cup final tournament in Spain, England wore white numbers on the right thigh in a different font to that on the reverse of the shirt. Against Czechoslovakia and Kuwait, the Admiral logo was positioned above the number, whilst against Spain, it returned to its usual position, on the left thigh. At the beginning of the 1981-82 season, a new sock design was introduced. The red and blue stripe across the tops was replaced by a thick royal blue hoop, overlaid with red logos, but without the 'Admiral' lettering. England reverted back to the original sock design, without the Admiral logos, for the three games in which this uniform was worn at the 1982 World Cup final tournament in Spain. The second sock design was then used for the last 12 games in which this uniform was worn with white socks. 59 England internationals appeared in this shirt. 29 players made their international debut in the shirt, including John Barnes, who went on to win 79 caps, and Terry Butcher, who won 77. Thirty players won their last cap in the shirt, including Dave Watson (his 65th cap), Kevin Keegan (63rd) and Emlyn Hughes (62nd). Eleven players won all of their caps in this shirt, including Garry Birtles, Steve Foster and Derek Statham, who won three caps each. Nine players scored their first international goal in this shirt, including Bryan Robson, who went on to score 26. 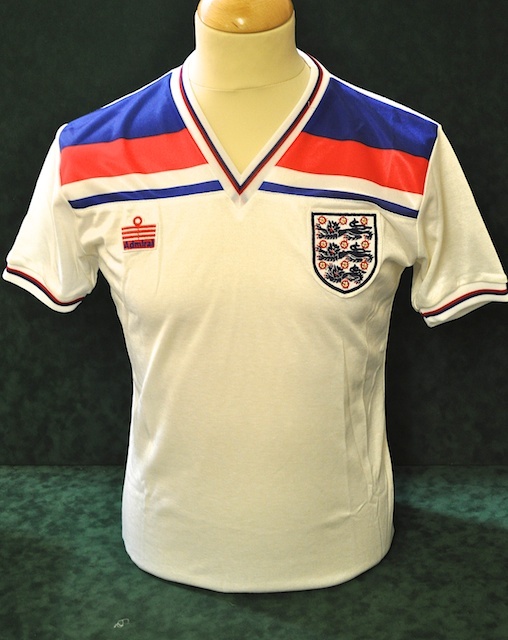 Fifteen players scored their last international goal in this shirt, including Kevin Keegan�s 21st. Six players scored all of their international goals in this shirt, with Luther Blissett�s three, all coming in one match against Luxembourg, at Wembley, in 1982. Only three of the nine had not captained England before (Cherry, Neal and Wilkins). Four defenders wore this shirt when they captained England for the last time (Hughes, Mills, Thompson and Watson). England celebrated the end of the barren spell that was the 1970s, by qualifying for the finals of the European Championship as the tournament expanded to eight teams. In the six years that England had been wearing Admiral kit, they had experienced successive failures to win their qualifying groups in the European Championship and World Cup, but the arrival of Ron Greenwood as manager in 1977 had seen a new optimism and the run-up to Europa '80 in Italy was filled with a genuine belief that England were about to reclaim lost glories. A new kit design was commissioned to commemorate the forthcoming event and was unveiled for the first time prior to the game against Spain in March, though England wore their 1974 kit for the last time in Barcelona. Admiral came up with an even more flamboyant effort. Remember, this was the time when England stood behind the union flag, not yet the cross of St. George. So, it was red, white and blue that comprised the outfit and England emerged looking like they were carrying the union flag on their shoulders. It was a shock for the traditionalists, who still yearned for the success of the sixties, when England were bedecked in plain white shirts and navy shorts. In later years, however, this second and last Admiral home shirt took on cult status and was much sought after by collectors. The game chosen for its debut was a prestigious Wembley friendly against the world champions, Argentina, who numbered, in their ranks, a 19-year-old called Diego Maradona. The prodigy would have his day in the future at England's expense, but on this occasion, it was Kevin Keegan and company who stole the show. A convincing 3-1 victory made the world sit up and take notice. Who could stop England now in the little old European Championship? Italy, that's who. Before that, just four days after Argentina, Wales were to burst the England bubble with their biggest ever victory against their illustrious neighbours, who would argue that it was an experimental eleven that travelled to Wrexham. England never really got going in Italy, in their modified kit, without the Admiral logos. Rioting fans and tear gas interrupting the opening game in Turin didn't help. Neither did some strange team selections against the host nation, three days later. The Admiral Sportswear brand was sold to another company in 1980, but the Football Association continued to honour the contract that they had signed. The following World Cup campaign was a rollercoaster ride of emotions, with England qualifying despite suffering three defeats on the road. When the time came, England hit the ground running and finally began to show their true potential, despite the loss of Keegan and Brooking through injury and a mysterious set of inconsistencies in the kits that were worn in Spain. A new set of lighter shirts was sent out for the Kuwait game because the players had complained that the polyester ones worn against Czechoslovakia had been too heavy for the hot conditions. The suppliers took the opportunity to slip an additional Admiral logo onto the reverse of the shirts. The shirts displayed at the top of the page were worn by Kevin Keegan (number seven, first two photos from the left), Kenny Sansom (number three) and David Johnson (far right). 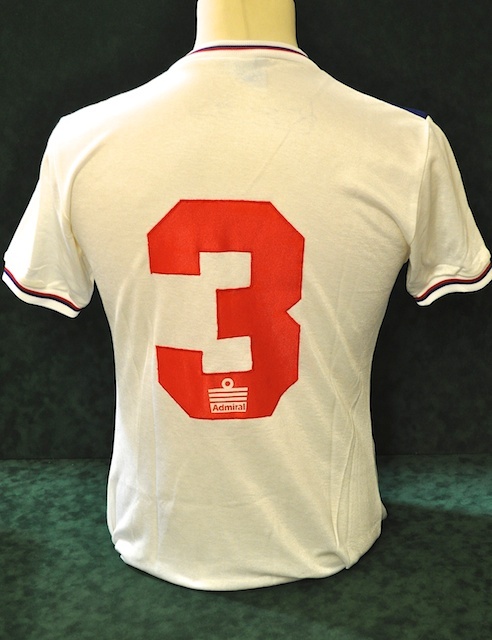 Sansom's was worn after the 1982 World Cup and sports the additional Admiral logo at the base of the number. Our thanks to Simon Shakeshaft, curator of the National Football Shirt Collection at England Match Shirts, for supplying the Keegan and Sansom shirt photos from the Neville Evans Collection. 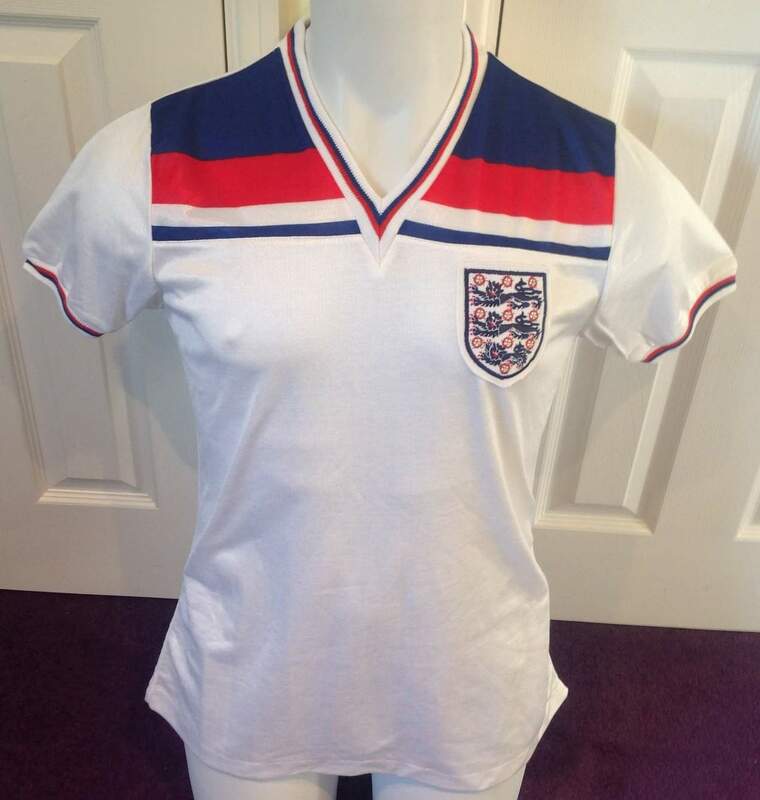 Johnson's, without the Admiral logo, was worn against Belgium in the 1980 European Championship (thanks to Richard Clarke's 'Three Lions - England Match Worn Shirts' Facebook Collection). Notes The Admiral logo did not appear on the outfield players' kits at all during the tournament. Notes England wore all white, the white home shirt and socks with the 1974 white change shorts, against Romania. Notes England wore all white, the white home shirt and socks with the 1974 white change shorts, against Spain. Notes England wore the white home shirt with blue home shorts, but wore the 1982 red change socks, against West Germany. (far left) Kevin Keegan lines up against Spain on June 18th, 1980. Note the absence of Admiral logos. Kit manufacturers were not allowed to advertise their products during the European Championship in Italy. (left) The practice of adding an Admiral logo to the base of the number, began at the 1982 World Cup and continued intermittently until the end of the Admiral contract in November 1983. England did not use the space again until 2005, when the Three Lions emblem appeared in the same place. A shirt issued to Peter Withe for the 1982 World Cup. From Richard Clarke's 'Three Lions - England Match Worn Shirts' Facebook Collection.